I truly didn’t expect or demand that Best Buy help defray the cost of my poor choice of buying the HD-DVD add-on for my XBOX 360, so it was a nice surprise when i received the strip-mentioned gift certificate in the mail. Having technology become obsolete quickly is something that comes with the territory, and everybody buying HD-DVD or Blu-ray players prior to Toshiba’s February 19th announcement knew that going in. I didn’t really take sides in this format war since I had both players (thanks, PS3!) but I did want to maximize my access to certain titles. Knowing that movies like Children of Men, 40-Year-Old Virgin, Knocked Up and Shaun of the Dead were exclusive to HD-DVD at the time meant that I would be picking up a player, case closed. Disney and Pixar being exclusive to Blu-ray meant that even if Sony hadn’t built a Blu-ray drive into every PS3, that I would be picking up a player no matter what. 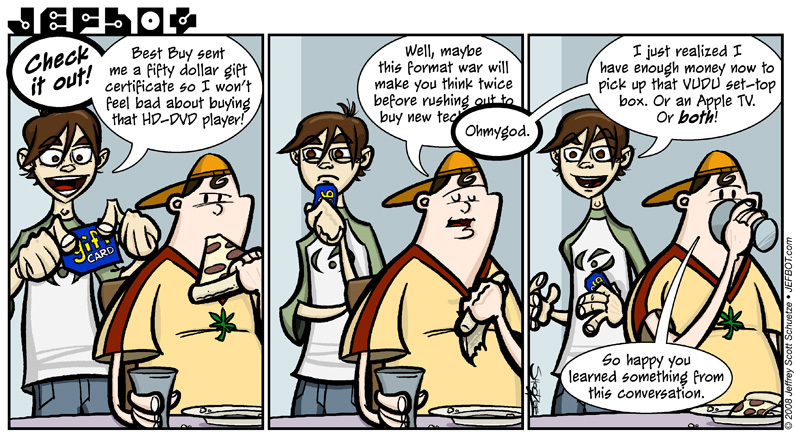 I’m glad there’s only one format going forward now, although I wish the “war” had gone on a bit longer – player and disc prices were coming down faster than expected and Blu-ray was adding features constantly to keep up with what HD-DVD offered. Now, prices are going back up and Sony doesn’t have as big an incentive to keep the technology updates on the fast track. Still, it was fun while it lasted. I was with you until you started talking tech. 😀 But as usual, it’s a beautifully drawn strip with outstanding epressions on the characters’ faces. Great work, Jefbot! michael, michael, michael, when are you going to another strip about your fab sista…? i love the little cake, “still alive” happy birthday again, when are we going out? Dude, frame one is the classic face that we have in every single real life pic. Awesome. I LOVE how excited you are in that first frame!!! It’s all in the eyes… And Mike is just over it! It’s okay, he doesn’t get it Jefbot. But I do! I love the smell of New electronics!!! Well done! The facial expressions are terrific!!!! Great strip! Lol, that sounds like me. (Mom says I’m bad with money.) Can you believe that!? XD XD Oh, and my friend said her nose was burning, ’cause she was drinking Coke.She also says “May all your bacon burn.” Lol, and idk what I’m getting, depending on if my mom lets me get another Pokemon game. It’s nice that Best Buy cares about your feelings. I’m sure they don’t want you to feel bad. Omg…the look of joy on Jefbot is irresistible! Phew! I spent the last 3 days (at work) reading the your entire archive! It’s hard to look busy when you’re laughing yourself out of your chair. Great stuff! Glad to be on board and look forward to staying on top of ya (figuratively, of course…although you are hot…)! michael cornacchia, you will learn to love the tech talk. 😉 thanks, man. unfavorite, which fab sister? i have two of them. #2 jefbot fan, glad you clicked on the “still alive” cake! love that song. go download it for rock band (for free!) if you haven’t already. akira, true dat. except now we’d be throwin’ up peace signs. heheh. funnyshaffer, i love the smell of electronics in the morning, noon and night. mary, thanks! seems people liked them expressions. jeff payton, heheh. feel like making a trip to the apple store this weekend? lor, well, maybe not. more like they want me to use the certificate on a blu-ray player, or more hd media, but with all the money i spend there they should care about my feelings!!! Still, when all’s said and done, the HD-DVDs did last a lot longer than their BluRay brethren. You only have to drop a re-writable BluRay disc and it stops working (plus it dies in about half the time a CD-RW or DVD-RW does). And there’s no single-write BluRays out yet, despite all the burners available. But BluRay won. Whatever. I’m not getting a BluRay player until DVD is truly dead.